[Update] LG Premier Pro LTE (aka LG L413DL) was listed on LG USA official website. Click here to find out Tracfone LG Premier Pro LTE Specs and features in details. 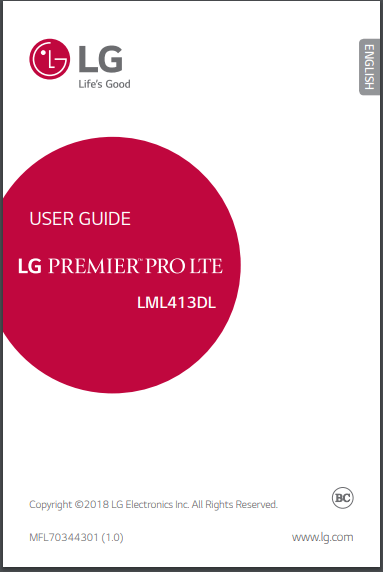 This is the official LG LM L413DL user manual in English provided from the manufacturer. The LG L413DL smart phone will be available soon from Tracfone, Net10, and Straight Talk. It runs on Android N 7.1 OS out of the box. LG official has published the LG LM L413DL User manual in English and made it a PDF manual ready for download. Those who are interested in this upcoming L413DL smart phone can download the device’s owners manual from below links. It is an Android OS 7.01 based smartphone with 4G LTE connectivity. It also has an 8MP rear camera and 8MP front camera. Those who are looking for LG L413DL Tutorials can visit Straight Official Support Page here. Please note that LG will not release stock kdz firmware for ALL Tracfone.StraightTalk and Net10 LG phones, So please do not try to modify the OS of this LG L413DL. If you bricked your LG L413DL, there is no way to unbrick it by flashing stock kdz firmware, Only LG official repair shop can fix your phone if your LG 413DL is bricked.